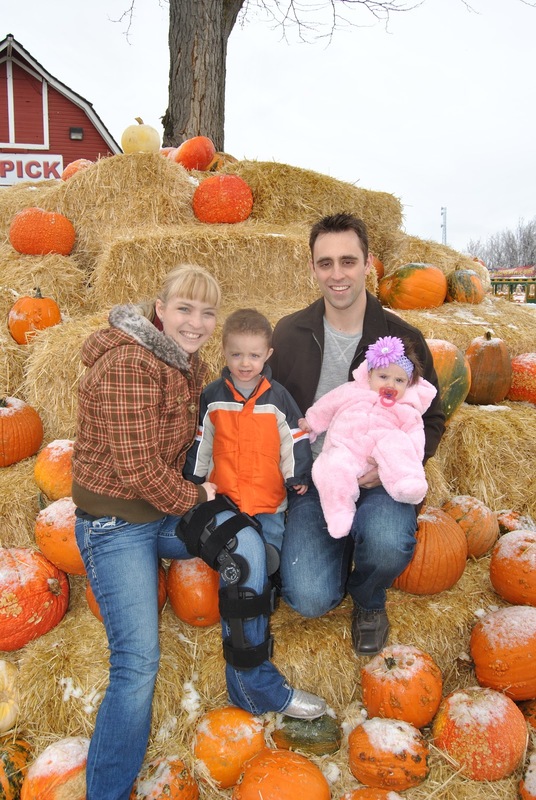 The Saturday before Halloween we had planned to go to the Red Barn U-Pick Pumpkin Patch to pick pumpkins. Because of the blizzard the night before, the pumpkins were covered in snow and it was really cold! Carly and Will met us there and we all searched for the perfect pumpkins. Carson was so excited to see so many pumpkins! He likes to play with my pumpkin decorations at home, so he thought the real ones were really cool. Jason with his 2 kiddos. 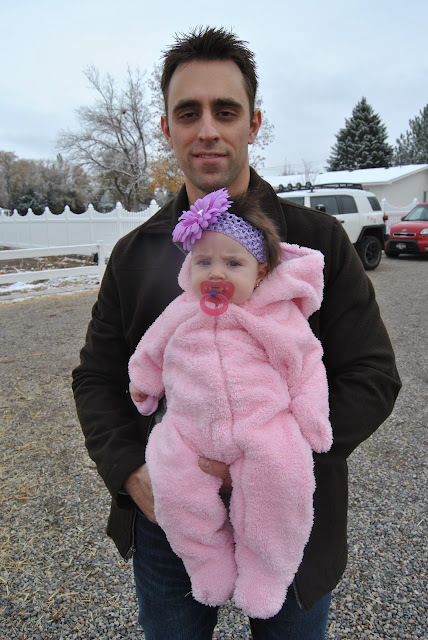 Brooklyn was really warm in her fleece outfit. She didn't seem to mind at all that it was chilly. Carson got to ride in the wagon with the pumpkins. He was bossy about which way we went and he was all smiles. Carson and Daddy picking out Carson's pumpkin! Brooklyn LOVES her Uncle Will. She is all smiles when he holds her. She just stares at him with a huge grin and tries to touch his face. It's pretty cute. The Red Barn has a train that you can ride around. Carson saw it and went crazy! He loves trains, and he loves riding on the trains. It was really muddy and the train got stuck a few times, but he didn't care. Mommy was freezing by the time we were done, and so was Carson, but he wanted to ride again! Once we were done riding the train, the conductor let Carson sit in his seat! Carson was very interested in all of the buttons and the train whistle. He was not a happy camper when we told him it was time to go. The only way we got him to leave the pumpkin patch was by telling him we were going to go have hot chocolate and pizza at home. I think next year we will go to the pumpkin patch at the beginning of October instead of waiting until the end. We should have known better since we live in Idaho.